There is an ever growing list of definitions for design. Some people agree with Nelson & Stolterman who’ve said that “Design is the ability to imagine that-which-does-not-yet-exist, to make it appear in concrete form as a new, purposeful addition to the real world (The Design Way)” whereas others prefer Tim Brown’s version: ”Design thinking is a discipline that uses the designer’s sensibility and methods to match people’s needs with what is technologically feasible and what a viable business strategy can convert into customer value and market opportunity”. For us, however, the most important lesson was that everybody can be a designer. The beginning process of our group work was well structured. It all started from group formulation and first assignment. We were instructed to choose one most inspiring service of the given public services. Decision were unanimous, we would look deeper into fascinating world of museums. Everyone took a pile of post-it notes, a pen and a square of own space and started 10 minutes ideation flow. How we could improve museum experience? What would be the services which will attract customer attention? Something exciting, novel and unexpected. After a short individual ideation time we introduced our ideas to each other and continued the ideation and development of the ideas. There were couple of ideas which were narrowed down. First was roadshow and the second idea was touching allowed for everybody especially for the children. The whole idea of museum on wheels started to take a shape. During the ideation we all shared same experience about the museums. Museums mainly are located at the city central and first association is dusty, hollow spaces were echo will never end and the artefacts are just standing still with meters along security space. For us this kind of an image wasn’t appealing not even mentioning the kids. The roadshow got the longer straw and we started to develop the idea further. By sketching we visualized the service idea. Something for the children, something to be experienced at your hometown and something to remember with one specific rule – touching is allowed. Main focus were to give holistic experience for families. By the end of the first contact day we had set our context for the upcoming service creation. Once everyone was made aware of the ideation process, it was time to apply it on the field. We were provided with set of instructions and on-the-field homework in group’s bucket during the previous contact session. We were provided with two articles to build the base for design thinking and the method for on-the-field service design. Both the articles “Thinking and Doing Ethnography in Service Design by Fabian Segelström, Bas Raijmakers and Stefan Holmlid” and “Design Thinking IDEO Harvard Business Review by Tim Brown” built our concepts for service design. The group showed a great deal of enthusiasm and commitment in dividing the tasks among ourselves. The tasks like Finnish museums pre-study, museum observations, interview of personnel and interview outside city area, were identified. The flow and skeleton of the report was confirmed when everyone started to add their pieces. As the focus was to generate the museum interest in generation next (kids), we chose Toy Museum as the central theme. Toy museum’s director took our service design field study very positively and promised all the support. We were in the museum for couple of hours and did our ethnographic field observations. The corresponding museum personnel and customer interviews went really well. We came out with prepared and on the spot service ideas for the museum which were appreciated by the museum staff. Our main theme rotated around the museum on wheels and we started building up the story around it. The in-situ observations, interviews and generic observations were noted down as part of field notes document. A lot of key words and activities like – co-creation, workshops, customer experience – came across while interviewing the staff. The field notes document (in Prezi) developed over time emerged as an informative and critical artifact, thanks to the group as they stick with the plan in developing it. At this stage, group was all excited to see the overall outcome in terms of field notes and the feedback from lecturers. On the 2nd contact day, we were introduced with different methods and tools which can be applied when the service provider is creating a service process and communicating ideas with other colleagues. Such methods include collages, scenarios, prototypes, games and drama enactment. The purpose to use them is to understand fully a new service process, its influence and outcomes. Things are always understood in a better way when they are expressed through the images. During the class, we were divided into groups to play the Silent Game: two people inside group to build up lego blocks. The interesting part we felt was that no one was allowed to speak during the project, however both of them needed to be clear what the goal of the project was. That was also the difficult part of the game. The homework for that day was to create scenarios in each team. What we did first was to define the roles for everyone based on our own subject. Then we were using our imagination and creating scenarios for each role according to a certain time frame. Some of us found images from magazines and some found from internet. When we were done, we put all our works into a shared file. Before we uploaded to Optima, we had a skype meeting which was very efficient and useful, because we were able to discuss and gather all the information once again, no misunderstanding and nothing was left out either. (Here is the link to our second presentation). In fourth contact lesson at 8th of November Mariana Salgado and Sanna Marttila taught us what were critical artefacts and how to use them in our concepts. A critical artefacts in participatory design is inspired by critical design. Critical design use design proposals for challenging preconceptions and prejudices. It is more an attitude than a method. It makes things more visible and creates discussion and debate. These design objects are not made to be mass products, but meant to provoke debate and to tackle delicate issues (case Piano Stairs). Concept cars in the car shows can be described as critical artefacts, because they will never be done, but they feed the imagination. We were given task to create critical artefact and present it with drama. At the beginning we did not know how to start, but with the help of post-it –tags ideation, we had many possible extreme ideas. We combined few ideas together and proceed to make prototype for the drama. Our idea was to present a case, where children were waiting for a Museum on Wheels bus to come, but their mother had to take a work phone call and left them alone there. A bus comes, but it is not the right bus and it is aimed for adults. Children steps in and begins to explore the bus. Mom came back and was shocked of the wrong bus. Right bus comes and driver tells mother to leave mobile phone to mobile phone cloakroom. This was the critical artefact, but then we realized from the drama presentation that in fact the wrong bus itself was a critical artefact. We understood Museum on Wheel bus display room should have everything located on the right height for children and reachable with hands. Design thinking course was great way to begin our studies in Service Innovation and Design Program in Laurea. We were encouraged to enable our designer brains from the very beginning. The lectures were kept short and hands on activities occupied most of the contact session times.Be it the 100 lines sketching, legos silence game or the scenario creations – all forced us to wear the designer hat and think. We learn also how to work in multicultural and multidisciplinary team with an objective in mind and to produce the qualitative results within specific timeline. The course was great beginning for our studies, because we got to know each other more and gave us a valuable sneak peek of what is still to come. In addition to the concepts and techniques what we learned from the lectures was more about people with different culture and backgrounds, and about how to respect one another and how to be open for new ways of working. We had dynamic group where it was great to share our strengths and weaknesses, and based on that we found our natural roles in the group. Good team spirit carried us all the way to give our very best and explore our skills in design thinking. This blog post was created as an assignment in SID course Design Thinking. Thanks for the info Mariana. Joined the linkedin group now. Thanks for an interesting post! I found it interesting how the process of designing such a critical artifact often challenge its audience’s preconceptions and expectations thereby provoking new ways of thinking about the object and its use. 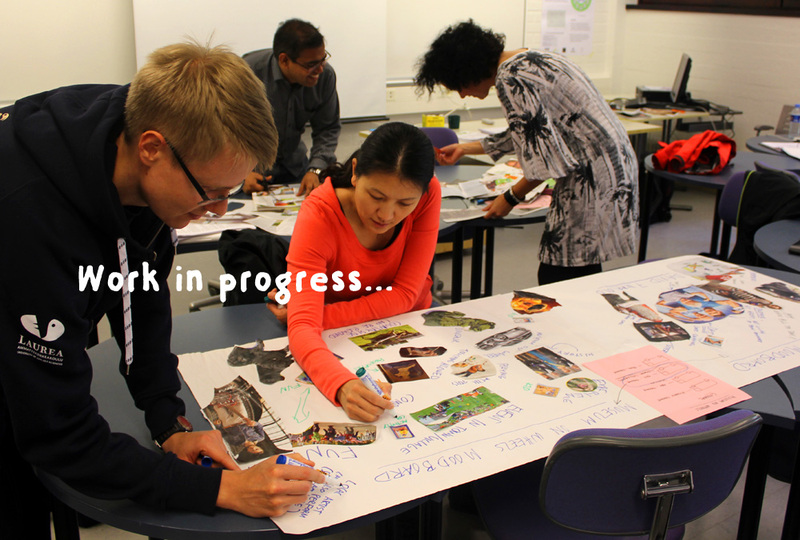 Blog describing exactly everything we have done in Laurea on Design Thinking course. I like that you stress words about new ways of thinking – critical artifact. It was a great lesson for me. I failed there but raised later with double power. The way I am looking about surroundings changed for me diametrically. I am designer and we all can say – “yes, we are designing!” 😉 ! During the lessons we learned about design thinking methods and we got to know each other. But we learned from ourselves, too. A good blog post, thanks. After reading all posts i really like thet we our group has understood the essence of design thinking; treat yourself as a designer and be open every day for new ideas. Well done! I really liked the way you described the process how your group created the scenarios, it sounded like you really enjoyed it.